Get Ready For..Squids in Space! If the final launch of the space shuttle Endeavour happens next week, on-board will not only be human cargo, but baby squid as well! No, these astronauts will not be eating calamari, these squid will be alive and provide a better understanding of bacteria in space (for the sake of us humans). Bacteria has been studied in space before- but only the bad kind. Salmonella was sent up in 2006 on the space shuttle, and when it returned the bacteria was almost 3 times as likely to kill mice than normal. E.coli is another example of a bad bacteria which also changes its behavior due to exposure to anti-gravity. 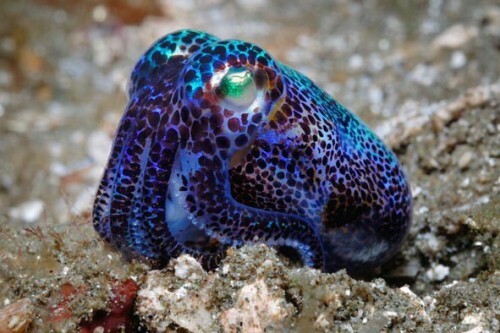 The squid of choice to make this epic journey is the bobtail squid Euptymna scolopes. This Pacific species was chosen particularly because it carries a type of bacteria called Vibrio fischeri in its body. The bacteria houses itself inside their light organs once the baby squid hatch. The bobtail squid use this light to shine downward so prey/predators don’t see a shadow cast of the outline of the squid from below. This type of relationship is a great example of mutualism-where BOTH organisms benefit in a relationship. Humans also have mutualistic relationships with bacteria- in our stomach and immune system. Foster’s preliminary research which mocked micro-gravity appeared to show problems the uptake of bacteria by the squid. Which could ultimately mean that mutualistic bacteria in humans in space could be affected.